First of all, THANK YOU!!! These are the two simple words I'd like to say to all (too many to mention) those who sent me birthday wishes via SMS, email, twitter and Facebook; they are really appreciated. That was so nice and unexpected! I am so grateful for the online friends I have met through the blogosphere. These friendships are all of equal importance to me; they all add warmth and color to my life. When I started this blog, I never thought anyone would read my crappy blog because just like what David said, "...when you see a title like that for a blog, you may not want to go back to visit. But..." click here to read it. In my 2 years of being a blogger, I consider myself very fortunate to have a wonderful relationship with my readers and other bloggers because, to me, friendship is one of the most glorious things on God's green earth. And big thanks to Mariuca, LJ, David, Lily, Bill and Ane for the beautiful posts (click here, here, here, here, here and here). You guys are awesome; thank you for making me cry my eyes out (in a good way of course) and I had to go back later to comment! I am so touched and I just, don't know what to say. After crying and feeling touched, here I am now, blogging about a bunch of people who have always made me feel loved. I'll blog about my birthday week and I'll be posting tons of pictures (Ooh la la... more than 100 pics ) so be sure to keep an eye out! I've been eating a lot like a... "oink oink" lately. Enjoys food to fullest! Life is great! Now can reply by email edi woot! Miss Pangkor so fast after just got back? Ha ha! Mon still on vakasi mode I see! Sure GG will cry here if she misses this one! Yeah LJ tweet on TF, now can reply by email... and it's working fine for me too. 3FC te mon coz ur besday!!! :'( :'( :'( :'( :'( lol! LOL i tot u FC2 GG he he... nemind.... next one u can chop! More LOL cause GG so cute! Don cry la! I oso wan to guess!!!! VS can do nothing it seems ha ha! VS can GALM u down GG lol! Yayks! Flooded today here at TUO! Happy Birthday once again Mon! All birthday wishes you received are a reflection of the person you are to your blogger friends which I'm glad to be one of them. It definitely shows how loved you are indeed. I only joke around about your blog, and you play along with it. It's a way to have fun, and that's just how I am which you know by now. My dear Monica, wow! see.... within just a period of short time, there so many comments here already, they all love you tau .... Don't forget to come around to listen to your birthday song at my blog just added, ok? I'm glad to hear you shed tears of happiness. Enjoy every moment of your special day. have a good day today GG! I wan to guess too but must =-X =-X =-X =-X =-X for now! I got lots of chocs GG! :'( :'( :'( :'( :'( yah wan some more GP? ive read those posts oso!! peeeeeeeeeee beeeeeeeeeeeeeeesdaeeeeeeeeeeeeeeeeee te moooooooooooon!!! can u throw some to me GP? il catch that sure! OMG What a Spread!!!! I'll have a big slice of cake please!! I know I am very late, but happy belated birthday to you, I trust your day was filled with love and happiness. May there be many more, and may all your wishes come true. i hope it's not too late for me to greet you a Happy Birthday!!!! Awww! the foods are yummies! Happy birthday pretty Monica! 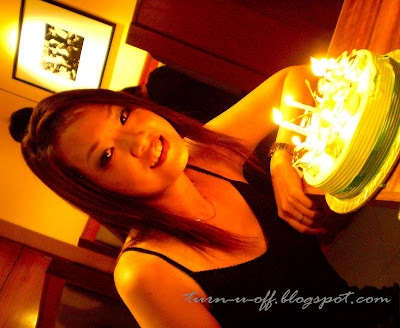 happy birthday to sweet, caring, nice, awesome, baik hati, periang dan Ceeerrriiaaaaa Monica. I wish you all the best. May all the best of things be with you. May you happy always Mon.